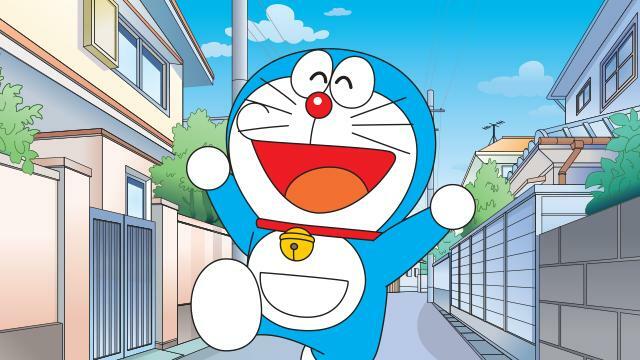 This autumn sees two iconic anime serials finally reaching the British public – Doraemon, screened on the kids’ channel Boomerang, and the original Gundam, coming from Anime Ltd.
Doraemon is such a popular figure in East Asia that he has sneaked under the radar to entertain kids in Korea and China, many of whom still don’t know he’s Japanese. Despite being a hapless, accident-prone robot cat, he is much beloved, and the centre of a merchandise industry that keeps his owners very well-off. Gundam, meanwhile, is a show about children dragged into a conflict in space using majestic bipedal war machines. It is a vital influence on much anime in the last 40 years, not merely in terms of straightforward imitations, but of entire studios and franchises conceived in reaction to it. Although that’s less important to its owners than the vast numbers of robot toys they hope to sell you. Doraemon’s appearance on UK TV is not that of a 42-year-old show – it’s starting with episodes that were first broadcast in 2005. But the classic Gundam on offer really is the first series from 1979. It’s older than most NEO readers. As an anime historian, I am very pleased to see these shows turning up – both are vital to understanding the business of the last 40 years. As a consumer, I can’t help but wonder if both are less about Japanese culture going global, and more about a recession-hit Japan, desperately scrabbling in its bins for any off-cuts it hasn’t sold yet. As this column has noted in the past, there’s a lot of Japanese government boondoggle money available, but only to people who already have something to sell. There has been much talk recently about exporting media. A cynic might suggest that this is less about a breathless passion for Cool Japan, and more about a bunch of companies sitting on intellectual property that has been paid for and isn’t doing anything. Somewhere in Tokyo, someone in a suit has been pointing at a chart and enthusing about “new” markets. To an accountant, the money that Gundam or Doraemon have racked up in Japan looks like a cash-cow waiting to be milked. If x million people pay for these shows in their home territory, then surely there are y billion people waiting overseas to pay for them? Are there? It’s a gamble for the foreign distributors, although the Japanese rights-holders are largely playing with other people’s money, or perhaps misguidedly equating their own nostalgia with a niche in overseas markets. Who really stands to lose if these “new” releases turn out not to wow modern British audiences the way they wowed the Japanese all those years ago? Jonathan Clements is the author of Anime: A History. This article first appeared in NEO 142, 2015.